It's Thomas the Tank Engine! Granted, now I feel a little different. It might have to do with the fact that I live near a train station. If I leave the island via the South Bridge, there are about seven tracks within a two mile radius. And only one street has a bridge that goes over any of them. I spend a lot of driving time stuck behind trains. Lines stretch down whole mile blocks, plus cross streets where people can't turn, and wait times can be 30 minutes (though 10 is average). I once had a train slow down, stop, and then reverse direction only to stop again three cars away from clearing the road. It's a nightmare. Many times alternate routes are also blocked by trains, and there's no schedule to base your driving on. Needless to say, they do help with my patience. Especially when you get caught by two on your way home after errands. They've also increased my daring, I've looked at many a train, thought, I've got time, and speed around the railroad gates and over the tracks to freedom. When the bridge opens to let freighters by though, there's no escape. It's the only way on and off the island, so those lines get extra long. I've finished chapters sitting in my car waiting for the bridge to lock into place again. Hmm, that sounds like a nightmare. Too bad, that sounds really annoying! I've always thought it would be fun to travel across the country on a train. The reality would probably be very different, however! There's nothing worse than being stuck in a car waiting for them to pass. 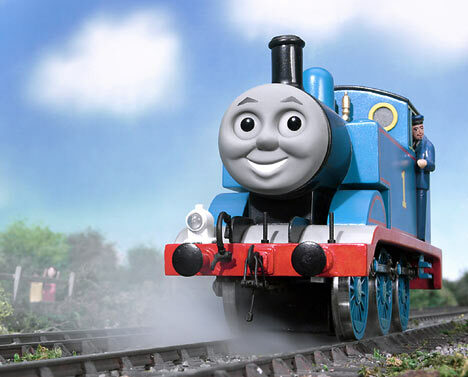 Oooh - I loved Thomas and friends as a little boy. They weren't around much in Canada at the time, but I spent most of a year in England with my parents around 1980, and discovered them then.